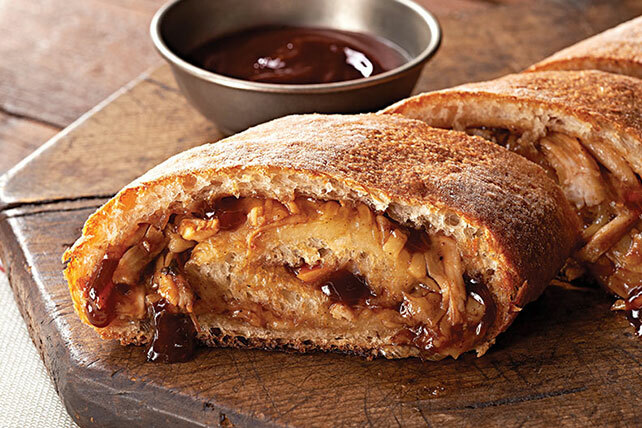 Shredded mozzarella and provolone are rolled up with chicken and BBQ sauce in refrigerated pizza crust dough to make this awesome, easy-to-eat party food. Unroll pizza dough onto lightly floured surface; press to form 12x8-inch rectangle. Brush 1/2 cup barbecue sauce onto crust to within 1 inch of edges; top with chicken, onions and cheese. Starting at one long side, roll up to form log; pinch edges together to seal. Place, seam side down, on baking sheet sprayed with cooking spray. Bake 20 to 25 min. or until golden brown. Let stand 10 min. before slicing. Serve with remaining barbecue sauce. Prepare using KRAFT Shredded Mild Cheddar Cheese.